On Monday, I posted some 1930s paper doll dresses and I wrote about how the 1930s just don’t “do” it for me, unless I see something that intrigues me. This applies to other fashion themes as well. Post-apocalyptic fashions are a source of some tension for me, because after a while, you can only draw so many torn shirts. Still, I was going through my A Pose paper doll clothing and I noticed that it all felt really feminine and soft to me. 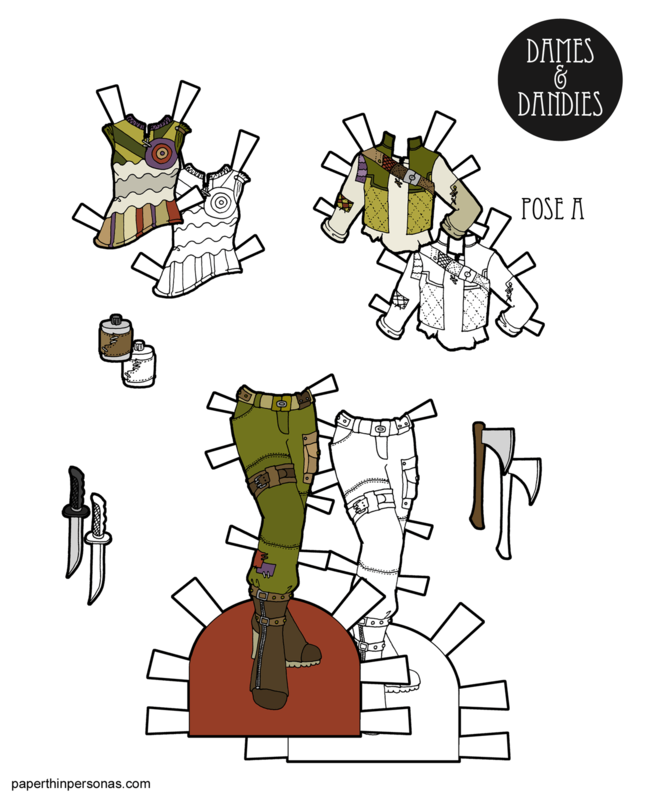 So, I said to myself, the A Pose paper dolls need something a little harder and less feminine. So, the end of the world seemed like a logical thing to embrace. I chose post-apocalyptic, because I found this great picture on Pinterest of some sort of futuristic, post-apocalyptic mechanic and I was intrigued. The mechanic part I didn’t keep, but I totally adapted her pants. I also gave them a hatchet, because sometimes you might need one and a canteen, because all the other post-apocalyptic sets have one, darn it. I did notice that I now have a post-apocalyptic outfit for all the different poses. There’s the C pose version and a B Pose version as well. It’s almost turning into a collection, but I don’t know what I’d draw next for it, so I’m not ready to declare it a project, yet. These are so much fun— I love clothing with patches sewn on! You have to be stylish at the end of the world! I always love your level of detail, like the quilting on the jacket and stitching on the pants & bottle.